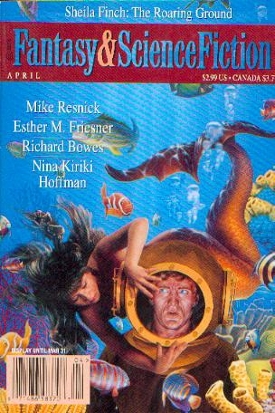 Few writers have had the success that Mike Resnick has had in selling humorous SF/F stories. Then again, few writers have had his success selling stories period. 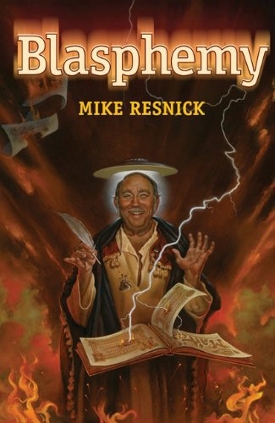 And while Mr. Resnick stands as testimony to humor’s continued viability in the SF/F marketplace, his comedic short story collection, In Space No One Can Hear You Laugh, does highlight the ongoing problem of the lack of critical respect for humor come awards time. Consider that when this collection first appeared in 2000, Resnick was already well on his way to earning bucket loads of awards and nominations. And yet for all his accolades, not one of these humorous stories garnered so much as a Hugo or Nebula nomination. One could (erroneously) conclude from this that Mr. Resnick writes lousy comedy, but even if that were the case, it would still not explain why other giants of SF/F humor like Douglas Adams, Kurt Vonnegut, Terry Pratchett and Robert Sheckley have between them a grand total of zero Hugo and Nebula wins. For whatever reason, our culture (both in and out of fandom) puts a higher value on weeping and gnashing of teeth. But to tell the truth, it is not tears and fist waving that usually gets people through tough times, it’s laughter. Fortunately there are hints that this lack of respect may be changing, at least within SF/F fandom. The last ten to twenty years have seen an increase in recognition of comedy at the Hugo awards with wins for Redshirts, “The Dog Said Bow-Wow,” more than one humorous Connie Willis story, and even some Hugo nominations for Resnick’s more recent humor shorts. The Nebulas? Well, not so much. 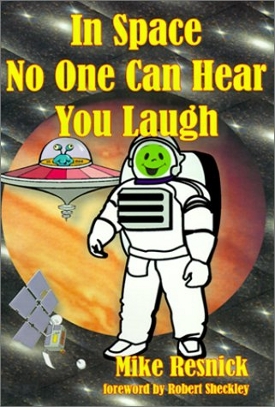 Not that I am suggesting that In Space No One Can Hear You Laugh is packed full of award worthy fiction. There are a few here that rise to that level, while the rest are at least entertaining. Most of the stories in the collection are on the short side (under 10 pages) and range across the spectrum from science fiction to fantasy. The stories also represent a wide variety of storytelling vehicles including fake advertisements, facetious articles, correspondence, an interview, news clippings, pastiche, a limerick, and plenty of traditionally structured stories as well. This diversity of story types allows Resnick to employ a mix of humor techniques resulting in a collection that is easy to read straight through if that is your want, although taking these one at a time here and there should also be satisfying. “Why Martians are Attracted to Big-Breasted Women” – A facetious article detailing a conspiracy within the SF/F writing community that answers the question posed in the title. Resnick takes a funny and unexpected angle which is directly targeted at the SF/F fan audience. “The Kemosabee” – A different take on the Lone Ranger story in which Tonto is a member of a Native American tribe that happens to be one of the lost tribes of Israel. “Posttime in Pink” – The first of three John Justin Mallory stories in the collection. For those unfamiliar with the popular series, Mallory got his start in the novel Stalking the Unicorn: A Fable of Tonight. Set in the same alternate Manhattan as the book, detective Mallory must solve a case involving racing pink elephants. “A Little Night Music” – A music promoter relates the tale of the most memorable musical act he has ever booked – Vlad and the Impalers. “Mrs. Hood Unloads” – Similar to the Kemosabee story in its infusion of Jewish humor. Robin Hood’s mother is complaining about her son to other ladies as they play a game of Mahjong. Good laughs here. “The Inn of the Hairy Toad” – A Conan/Grey Mouser parody in which Cretin the Beggar has been confused with Krotan the Conqueror and is periodically visited by creatures intent on exacting revenge. Cretin and a Djinn transformed into a muscular barbarian warrior decide to take matters into their own hands and dispatch the fierce Krotan themselves. “Beibermann’s Soul” – Interesting comedic take on art and commercialism. Beibermann wakes up one day and notices his soul is missing. Figuring he has misplaced it somewhere, he searches for it but eventually must get back to his writing despite having no soul. “Revolt of the Sugar Plum Fairies” – Very funny story of cute, little, blue fairies out for bloody revenge. But first they have to get unstuck from the floor of Arthur Crumm’s basement. This is one of the award worthy stories. “Will the Last Person to Leave the Planet Please Shut Off the Sun?” – The exodus of various groups from planet earth as told by a bigoted American who is happy to see them go – at least initially. “The B Team” – One of Resnick’s African stories (for which he frequently gets award nominations, unless it happens to be comedy). Facing overwhelming British forces, a Mau Mau warrior seeks help from a witch doctor who attempts to summon a god to help them. The god they get is not quite what they had hoped for, but he is enough to push the British into summoning a god of their own. I enjoyed it as much as any of his Kirinyaga stories, only with more laughs. “The Summer of My Discontent” – Due to the success of Mel Gibson’s Hamlet, the director of Sluts of Saturn is told he must make a Shakespeare film and tries to adapt it to fit movie stars like Arnold Schwarzenegger, Sylvester Stallone and Tom Cruise. “Genesis: The Rejected Canon” – An alternate version of the biblical Genesis. Funny flash fiction of interest to the LBGT crowd (and Christians with a sense of humor). “How I Wrote the New Testament, Brought Forth the Renaissance, and Birdied the 17th Hole at Pebble Beach” – Another story with a Jewish angle. One of the people who joined in the taunting of Jesus as he was crucified is cursed with having to live until the Messiah’s return. “Stalking the Unicorn With Gun and Camera” – Not to be confused with the similarly titled John Justin Mallory novel. A Parody of articles found in hunting magazines. Three examples of failed attempts to hunt a unicorn are presented along with advice on how to learn from their mistakes. “The Blue-Nosed Reindeer” – The second John Justin Mallory story in the collection. This time Mallory must find Santa’s stolen Blue-Nosed Reindeer in time for Christmas. “Frankie the Spook” – Originally written for Robert Silverberg’s shared universe anthology, Time Gate, (same universe as Silverberg’s Hugo winning “Enter a Soldier. Later: Enter Another”) but rejected because Resnick wasn’t taking the story seriously enough. A man tries to coax a computer generated Francis Bacon to ghost write for him. “Darker Than You Wrote” – The true story behind Jack Williamson’s novel Darker Than You Think. Will appeal primarily to Jack Williamson fans. “Death is an Acquired Trait” – An alien species advances to the point where they achieve immortality. Then they spend the rest of their time trying to figure out how to die. Love the ending. “Classifieds” – A bunch of fake classified ads from the future originally sprinkled about in the July 1991 issue of Analog. “God and Mr. Slatterman” – A somewhat inept version of God lectures Mr. Slatterman for taking His name in vain, not observing the Sabbath and so forth. “Stanley the Eighteen-Percenter” – Stanley Mitterwald is an agent that is so good at negotiations that he gets an eighteen-percent cut and gets some exceptionally challenging clients. Lilith, of Jewish mythological fame, wants to renegotiate her contract with the devil. “A Limerick History of Science Fiction” – Exactly as it sounds. Fun for SF fans, but of little interest outside of that. “King of the Blue Planet” – Written for the Fleet shared universe. Lizard O’Neal runs a bar and brothel on a planet so far out of the away that it is of no strategic military value. Unfortunately its remote location makes it ideal for a peace conference. Entertaining with some very funny bits like the reborn virgins who staff the brothel and the renaming of the bar. “The Trials and Tribulations of Myron Blumberg, Dragon” – Myron’s nagging wife grows increasing embarrassed as he gradually turns into a Dragon. At one point she insists that she put a leash on him and tells the neighbors that he is a dog. “His Award-Winning Science Fiction Story” – The story has barely gotten underway when the characters begin to argue with the writer, criticizing his story. Good third-wall breaking fun. “Was It Good for You, Too?” – An inventive thief tries to seduce a bank’s computer security system. “The Crack in the Cosmic Egg” – A man attempts to build a FTL drive in a rare hard SF story from Resnick. Cosmology with a darkly funny twist. My Girl” – A man writes a letter to a friend extolling the virtues of his new girlfriend, unaware that she is a vampire. “Monsters of the Midway” – A scientist who won a Nobel Prize for reanimating dead tissue creates five monstrous offensive linemen for the Chicago Bears. Told through a series of sports news articles. “Malish” – Fictionalized account of a supposedly real horse (Resnick wrote a racing column for 17 years) that was known for its unusual burst of speed on the far turn. “Stop Press” – A decidedly fun series of correspondence between a writer (Marvin Resnick, twelfth generation descendant of Mike) and a tabloid editor (descendant of Esther Friesner – editor of the anthology this story was written for). “The Gefilte Fish Girl” – A Jewish man tries to explain to his mother that he is engaged to a mermaid. Resnick manages to mimic the characteristic Jewish mother’s voice for some good chuckles. “Mrs. Vamberry Takes A Trip” (as by J. Thorne Smith) – Written for an anthology of Sherlock Holmes stories as if written by various authors of the 1920s. Resnick got to do Thorne Smith (see my review of Thorne Smith’s The Night Life of the Gods in last month’s Scide Splitters) and did a bang-up job of it. Plenty of hilarious dialog as the characters talk at cross-purposes, and naturally there is a fair bit of alcohol and sexual innuendo. “Inquiry Into the Auction of the United States of America” – Written in the 1980s as a humorous projection of the growing national debt. The story jokingly predicted an unsustainable sixteen trillion dollar debt in the year 2016. This is a case where the truth turned out to be more outrageous than the joke as we have already hit sixteen trillion in 2014. “Costigan’s Wager” – Flash fiction written for bookmarks that were part of the 1992 Orlando Worldcon bid. A Man is playing chess with Satan. Providing any more detail would spoil it. “Card Shark” – The third of the John Justin Mallory stories in the collection. Someone is threatening both Mallory and one of his clients with grim tarot card prophecies and the detective must solve the case before the predictions come true. “Interview with the Almighty” – Resnick conducts a one-on-one interview with God. Back and forth dialog with some pretty funny jokes. The overall quality of this collection is quite good and should be satisfying to both Resnick and humor fans alike. Its continued availability in print (in hardcover and trade paper) bodes well for the potential for a second humor collection. And considering that Mike Resnick’s prolific pace has, if anything, sped up since this collection was published in 2000, there should be more than plenty of material available for a follow-up.